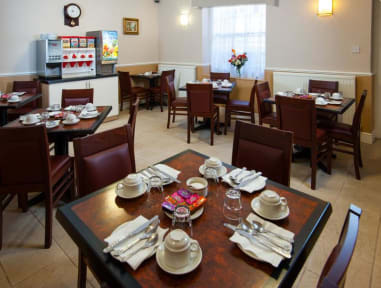 With friendly staff, excellent service and an ideal location, Dover Hotel is the perfect place to stay if you need a hotel near Victoria Station on your next visit to London. Please explore our site for more details, suitable for any budget, and feel free to contact us with any questions you may have. The Dover has a 24 hour Reception, 7 days a week. Check In is from 13:00 and check out time is up until 11:00 each morning. We provide safe boxes free of charge to all guests, in addition to free Wi-Fi throughout the building.Our room price includes a full Continental breakfast which is served in our elegant dining room. We are conveniently located near Victoria Rail, Underground and Coach Station (just 3 minutes walk), as well as the Gatwick Express for Gatwick Airport and other major transport links to provide easy access to all tourist and business areas. We’re also well located for shopping in Central London. We are within walking distance of Buckingham Palace, the Queen Elizabeth II Conference Centre, Whitehall and Parliament Square, as well as the London Eye, River Thames and Westminster Abbey. 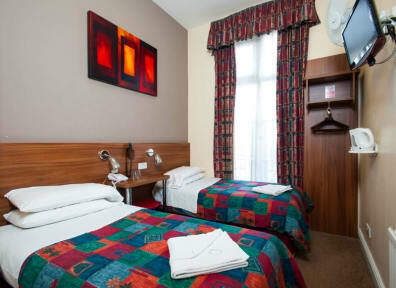 We have 34 rooms, ranging from amazingly well-priced Single Rooms, ideal for solo travellers on a budget, all the way up to 4- and 5-bed rooms ideal for families or groups of friends visiting the capital. All our rooms are modern, comfortable, well-equipped and well-appointed. Each centrally heated room is refurbished to a high standard and most rooms feature: Private Shower & WC, Cots with our Compliments (up to 12 months), Wake up call system, Clock radio, free Wi-Fi Access for our guests – connect up to 4 devices per room, Tea/Coffee facilities, Hair dryer/Shaving Point and Colour TV/Satellite. We have 24 hours Reception. Room was incredibly small. With two in the room and ur suitcases there was no floor space left. The room we booked was listed as private ensuite yet we had to share a toilet (shower was in our room but very small). Was advertised as full continental breakfast yet was a bowl of cereal and some toast. This does not represent a full continental breakfast. Apparently it is very cheap for the area and the location is good. However there if a premier Inn round the corner much cheaper.